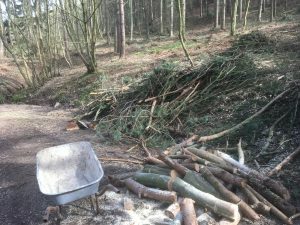 We have had another very successful volunteer day in Raincliffe Woods. The weather was very good again and the ground is drying very quickly. 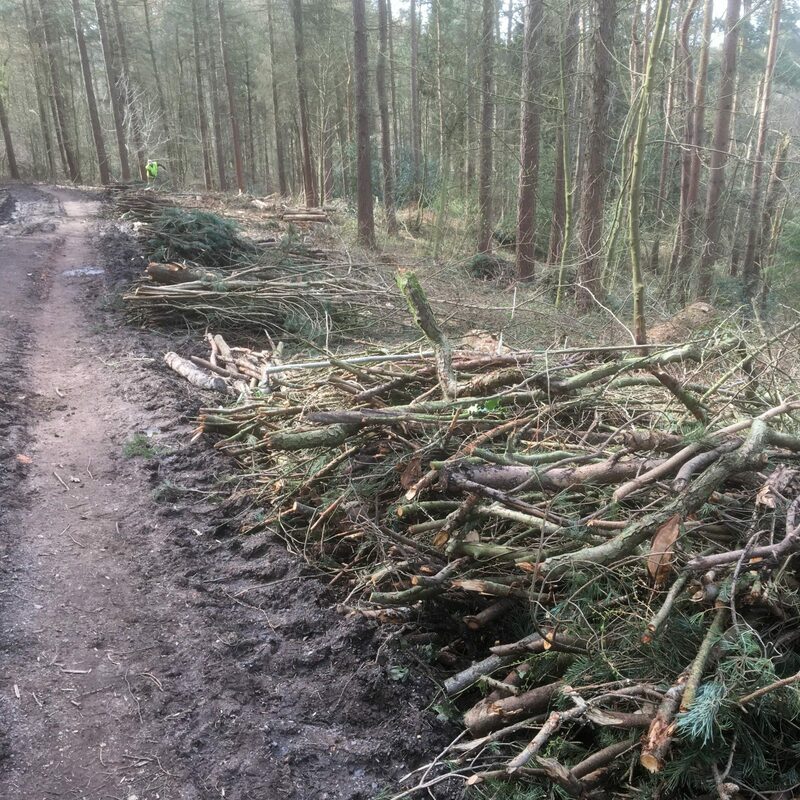 We concentrated on the brash near the Sawmill Yard and cleared a very large quantity of brash and sorted the wood for logging. In the afternoon Thorne Park Farm once again brought their chipper and a trailer this time, to take some of the wood chip to a picnic site to cover the muddy path. 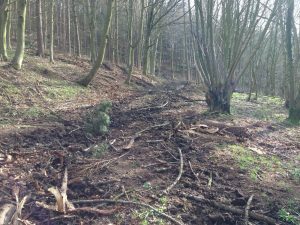 With the woodland floor cleared of brash we hope to see the green shoots of flowers and grass coming through. The real benefits will come in two to three years as flowers and grasses start to flourish. 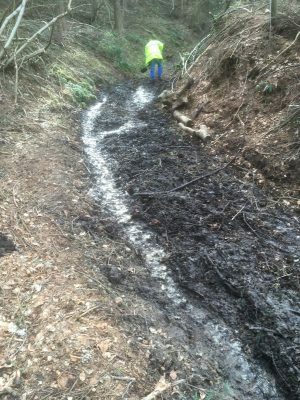 We also undertook more work on the public footpath down Cunsey Gate which had become very wet and difficult to walk. 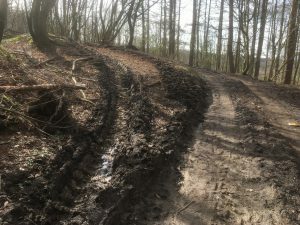 In the morning the source of the water was clearly numerous springs bubbling from the bank-side of the track and saturating the leaf mould and mud. 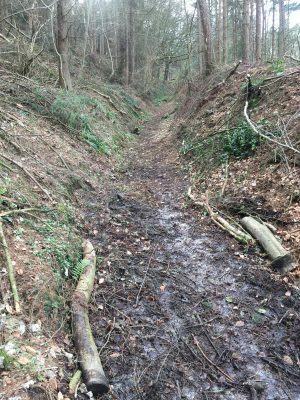 A ditch was created alongside the springs and directed down the track and into a drainage ditch. Underneath the mud was a hard base so we hope to see a dry path by the end of next week. 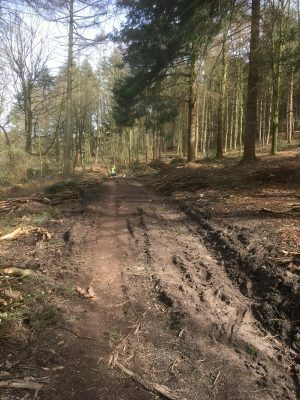 In the afternoon two section which were very deeply rutted by the forestry machinery were tackled. 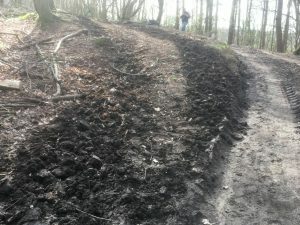 The soil and mud was still soft so not too difficult to spread back. For those who enjoy a gym workout we can recommend this type of work with a spade. 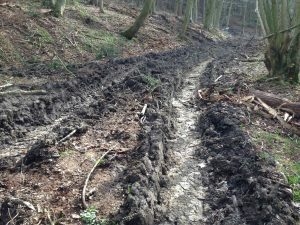 At the end of the day a very noticeable difference had been made and our thanks go out to all the volunteers who came and achieved so much.